Chatting to a blind user on Twitter, he said that his school, RNIB New College Worcester, used BBC Micros and a connected speech synthesiser (possibly on an output port shared with the printer). His recollection was around 1992-1998. He said from boot up to shutdown, they could get the BBC Micro/Master speaking all text output, and used CTRL+A to shut-it-up. Also remembered them playing Level 9's Lords of Time using the speech output. Wondering what would be needed to replicate this on BeebEm and also a real BBC Micro. Can anyone point me in the right direction, please? Any suggestions for the speech synth to use, and method of setting up much appreciated. I used to help a blind partially paralyzed accountant back in the 80s. He did all his work on a beeb with plug in speech synthesizer. It came with a ROM with the functionality you describe. He could also select lines up and down the screen and it would read them. I'm sorry, but I don't remember the names of either. 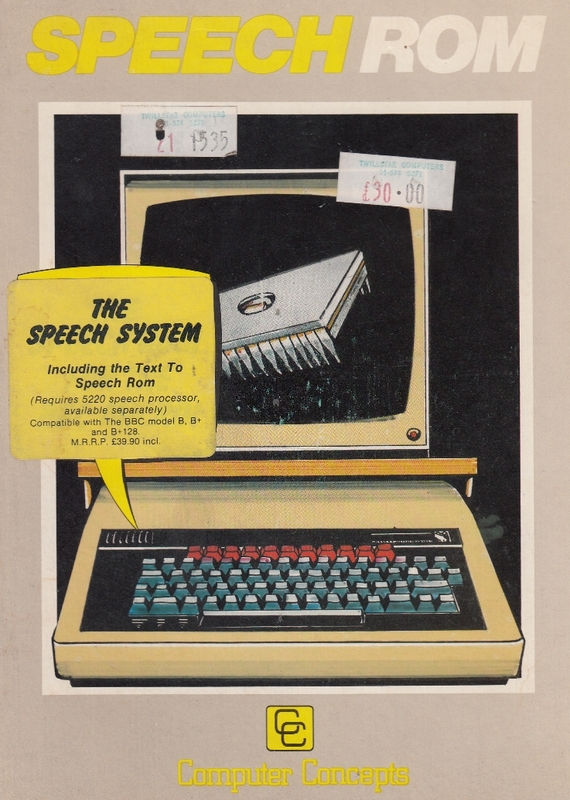 There is an older version of beebem with support for the built in speech synthesizer, but you would need something like the computer concepts speech ROMs for text to speech and probably an extra ROM to copy the output to the text to speech system. (I posted both somewhere here). Another option might be mame if you could get the ROM and if mame support the correct speech system and it can be connected to the emulated beeb. PS just remembered that that version of beebem has a built in text to speech option, but I have never tried it. Last edited by tricky on Sat Feb 09, 2019 10:38 pm, edited 1 time in total. I think we've previously concluded that the later version (special version?) of Computer Concepts' Speech rom includes a Text To Speech feature which I imagine could do what you're asking. I think we were perhaps struggling to find the full instructions but someone suggested that...."*SAYOP will speak anything sent to the output stream. *SHUTUP turns it off." Yes, the Computer Concepts Text to Speech ROM has this feature. a TMS5220, the CC Speech ROM and the CC Text to Speech ROM. *SAYOP will speak anything sent to the output stream (e.g. the screen). *SAYIP will speak anything received from the input stream (e.g. the keyboard). *SAYOFF will turn these features off. *SAYSCR will speak whatever is currently on the screen. *SAYFILE name will speak the contents of a file. *SHUTUP stops speaking immediately and flushes the speech buffer. *TEXOFF or Ctrl-Break deactivates the ROM. So we have them handy, I have attached the versions that I use - may not be the latest! CC_SPEECH_10.ROM is the code to control the beebs internal speech chip (if fitted). CC_TXT2SP_01.ROM is the "Text to speech" ROM, I'm pretty sure you need both. *TEXON will turn text to speech on and prompt for you to press break. *SAYOP will then read whatever is displayed, but I could not quickly get it working with games. CC_SPEECH_DEMO.ssd is the demo disc that came with the text to speech ROM. I have tweaked it a bit to load the ROMs into sideways RAM, but if they are already in the beeb, then you can *TEXON and CH."CC-DEMO". PS The CC speech system (like AstroBlaster ) doesn't need the track mods that the OS requires on boards before v7. EDIT: Updated TTS to v1.03 from below. Last edited by tricky on Sun Feb 10, 2019 11:07 am, edited 2 times in total. Last edited by OneSwitch on Sun Feb 10, 2019 10:49 am, edited 1 time in total. BTW, it's unlikely that these ROMs will work with most games since the game code will probably overwrite the workspace or vectors used by the ROMs. I suspect that is one of the reasons that the blind guy that I used to help had the external system, also that it was a little quicker at text to speech. With speech and TTS roms loaded in EEPROM. Last edited by marcusjambler on Sun Feb 10, 2019 7:17 pm, edited 2 times in total. Thanks again for these thoughts and info. From tinkering, I can't get that system working in BeebEm. I can load the demo, it puts "Hello Everyone" on screen then just sits there. Any ideas why? I put the two ROMs in slots 13 and 12 in BeebEm, typed *TEXON and chained the demo. I am thinking the external speech synth is going to be the way to get stock games working from what has been said here. That sends ASCII text to the external Votrax speech synth which does its best to pronounce it correctly. On the BBC Micro, I'm wondering if this can be replicated. Someway to output all screen text to an RS232 device. Wasn't there a way to set the screen text to be streamed to another output channel (e.g. for a printer / modem)? CTRL+A perhaps? Any thoughts on this. I'm very novice on this front on the Beeb. Turns out that one of the volunteers I work with on assistive tech projects developed the Echo II for the Apple II. We met last week at the ATIA conference in Florida. *FX to set rs423 or parallel printer. Ctrl B to copy output to the printer. Are you using the patched beebem that I posted a couple of years back or the old 403 with acorn speech support that I don't think works with the cc ROMs? Thanks. I'm using Version 4.14, Feb 2012. The best I've managed so far is with Windows narrator on, and BeebEm text-to-speech on with that Haunted Abbey (A&F) text adventure game. Then I can use the arrow keys up and down to read each line at a time. It gets a bit muddled for the user at the bottom of the screen, as you have to tap cursor up several times and then manually tap down arrow to read the correct lines. Nothing from a BBC era speech synth yet though. The Votrax was a pig on the Apple II that's for sure. I should get an Echo II. Hopefully less hassles, but it wouldn't sound like the Gorfian Empire on a day off. I'm impressed you work with the dev behind it. A lot of people were given a voice for the first time with that kit. Nice! Nothing sounds like a Votrax. Nothing would want to, mind. Wonderful stuff, thanks for sending that. What a brilliant organisation. Love seeing those early photos and videos especially. Have you seen the little push Google did recently on Morse Code entry? https://experiments.withgoogle.com/collection/morse. Really interesting. I've read of Morse Code being used on a PDP mini-computers for assistive tech experiments, around 1970. Good job computers got cheaper, that's for sure! Last edited by OneSwitch on Mon Feb 11, 2019 7:57 am, edited 1 time in total. Sorry if this is getting a bit tangled. I've heard one way to get speech read out well was with a Braid Speech Synthesier. I'd love to get hold of one, or at least a photo. Sounds very similar to a Votrax in that it worked on numerous machines (I've seen RM, BBC Micro and Video Genie mentioned). Look forward to hearing how you get on, Marcus. "Dr Tom Vincent of the Open University developed what became known as the Tom Vincent Workstation in the early 80’s. This was based on the BBC B computer, the speech output being from the Votrax Interpreter. I am afraid that mine disappeared in a fire here some 8 years ago. The software was largely bespoke, but augmented by Dr Dave Laycock at the Polytechnic of Central London, with his technician Graham Whitby." I have a Votrax... I wonder what else would be needed. Screen Reader: "Scread" or "Scred" mentioned for the BBC Micro. Tom Vincent Workstation used a Votrax. HAL by Paul Blenkhorn (not sure if BBC Micro) - designed for off the shelf software. "Talking Grass" - a database system and basic accessible speaking spreadsheet. Toucan Talking Unit - 16K RAM - ISO Pascal ROM - BBC Basic - with St Dunstans selling talking games.... "*FX2 started the speaking"
Already had someone saying they had lots of equipment but dumped the hardware and shredded the discs as couldn't find anyone to donate to. Common thing. Would be great to show how brilliant the BBC Micro was in the UK for accessibility. It definitely wasn't all Apple and DOS! I thought you might like to see/hear what it runs like with the built in speech chip and Computer Concept ROMs. It seems to get stuck at the end of the intro, which might be because PAGE is at &1D00 and it is expected to be at &1900, or it might just not be compatible! Maybe someone might want to try the TAPE version or an E00 DFS. Recorded using beebem (the old version hacked by me)! There may be a better option than *SAYOP as it takes multiple spaces (maybe new lines too) as places to break the speech. Last edited by tricky on Thu Feb 14, 2019 7:13 pm, edited 2 times in total. Getting close! Sounds nice, thanks for trying this and posting the video. Much better speech quality than a Votrax for intelligibility. Shame it's still not playable. Maybe all the solutions used external boxes, but it doesn't seem unreasonable for this approach to work. Emulation wise, I've found nothing that works well on the latest BeebEm so far. That includes Narrator, NVDA (excellent free screen reader for Windows) and the built in Text-to-Speech options that I could find in BeebEm. I can get lines read, but problems with skipped lines, and general confusion at the bottom of the screen makes gameplay impossible. I'm thinking perhaps a RS423 cable to DB25, then getting all the hand-shaking, baud rate and trying CTRL+B (maybe needing some special *FX calls) - to my Votrax might work well. Might need some currently elusive screen reading software to do it well. Thanks to the BCAB Discussion List (British Computer Association for the Blind): https://www.bcab.org.uk/ - I've managed to get BeebEm working well with speech on BBC Micro Text adventures and the like. SHIFT plus BREAK to boot load a game. ESCAPE to skip some instructions or musical title-pages. SHIFT plus ENTER to enter a command, such as N to go North. SHIFT plus BACKSPACE to delete a letter. CTRL plus HOME, END and CURSOR keys to navigate and go back to read what the computer's response is. Cursor keys UP/DOWN sometimes on their own, slightly confusingly. ...but this just isn't the genuine 1980s/90s experience. No lovely white on black Teletext Bedstead font. No BBC keyboard. Just doesn't feel genuine, as good as it is. No one has turned up any external speech synthesiser screen readers yet it seems.... Would be so good to find a way to make the BeebEm experience possible on the real thing. Really hope we can find a way to preserve this, even if just a few videos of it working on genuine hardware with the game fully playable. Fingers crossed. The Watford Electronics speech unit that I have only responds to input at the prompt or specific access during the running of a program.